What can I say- I’m a southern gal and I love gumbo. 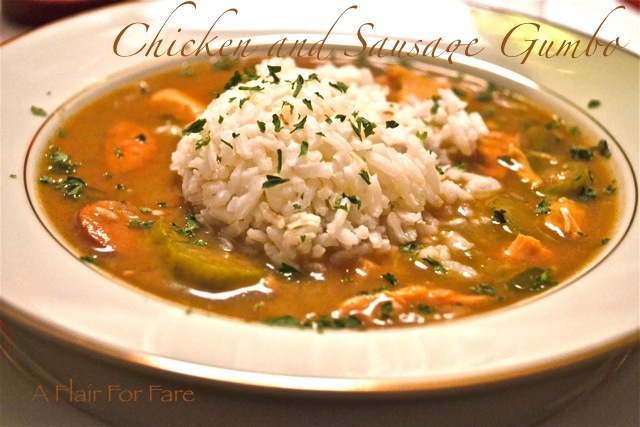 A southern classic that originated in Louisiana, this stew can be made with meat or shellfish. It starts with a deep brownish red roux made from oil and flour and is thickened with filé (fee’LAY) powder (ground sassafras leaves). The roux is key for successful gumbo. It does require some patience, as you need to constantly stir it for about 20 minutes, but it is well worth the effort. Down on the gulf coast of Alabama, I grew up eating seafood gumbo and that is by far my favorite. But here in the midwest, everyone doesn’t like shrimp dishes. I made this version for a dinner party I hosted for some friends and it was a big hit. Start by making a roux. In a Large heavy saucepan or dutch oven combine flour and oil until smooth. Cook over medium high heat for 5 minutes, stirring constantly. Reduce heat to medium. Cook and stir about 15 minutes or until roux is dark reddish brown. Stir in onion, celery, green pepper, garlic, black pepper and cayenne pepper. Cook over medium heat for 3-5 minutes or until vegetables are just crisp tender, stirring often. Gradually stir in hot chicken broth, chicken, sausage, okra and bay leaves. Bring to a boil. reduce heat and simmer, covered about 15 minutes or until okra is tender. Discard bay leaves, Stir in file powder to thicken. Serve in bowls with rice. Garnish with chopped parsley. Makes 4 servings. Note: If you don’t eat pork you can find andouille sausage made from chicken at your local grocery store.